There’s nothing more overwhelming than sitting down to a messy draft and preparing yourself for revision. You know there are problems, you may even know what to fix, but then all that text seems like a storm of activity ready to confuse and drown you. 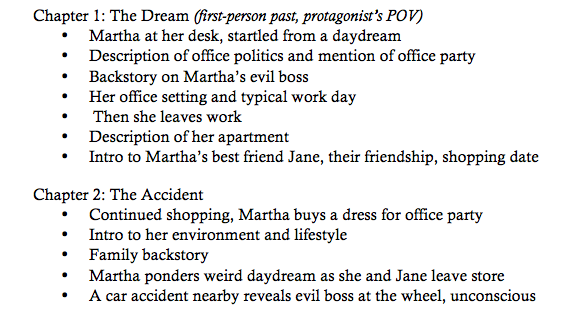 I’m a big believer in scene organization and story structure. If the puzzle pieces aren’t lined up in the right order and fitting together with perfect transitions, then there’s no use concentrating on the smaller details. I’m also a big non-believer in scrolling up and down a document maddeningly, chasing after pieces of content until my eyes cross. That up and down scrolling makes me feel claustrophobic even when I’m working in a spacious room. Do you want to shun the non-believer? Or do you want to start revising your scenes using a painless process? Some authors print out their whole manuscript, literally cut up sections with a pair of scissors, tape them back together in a desired order, then make the changes on their computer. The idea behind this method is to get out of that stuffy screen, get a wide view of the material, and easily reach for the section you need without scrolling. Sounds like a great idea. But it’s also a waste of paper and a lot of extra work. There's an easier, non-wasteful way to organize your story. It doesn’t actually start with scenes. It starts with subjects. 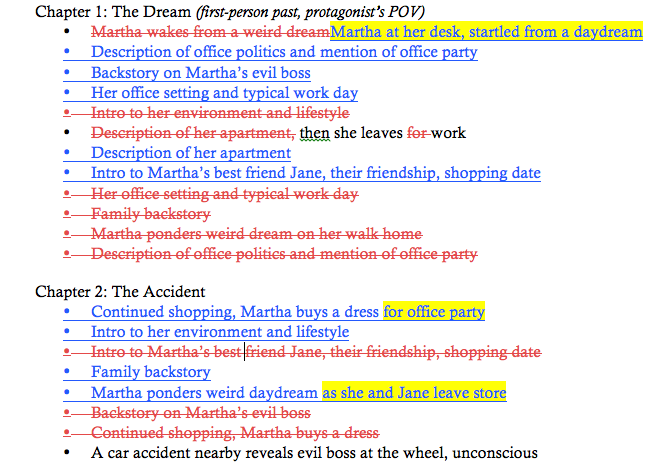 And I know my method works because I use it in my own developmental editing when authors need content organization. Step 1 - Open a new document. Copy and paste your Table of Contents into plain text. Step 2 - Also have your manuscript open. In your manuscript, slowly go through and note every time a subject changes in Chapter 1. You can highlight or color code each section or mark it with the comment tool as you go along. It’s whatever way works best for you. Step 3 - Write every subject as one line in your new document under Chapter 1. Continue to list each new subject under the chapter. Step 4 - Repeat steps 2 and 3 for every chapter until every subject is listed. These steps take me only 45 minutes to an hour. Easy-peasy. As you can see, within each chapter I have the subjects listed every time a subject changes. I’m getting a very clear view of how this story unfolds and progresses without getting swallowed alive by a hungry mass of text. It's so hungry. In this original arrangement, it’s easy to see the lack of action and excitement in the first chapter that could cause readers to abandon the book. Now that all your chapters have their subjects listed, you can move around the subjects until you get a desired order that’s going to keep readers hooked. It’s almost effortless. Almost. In this revision, I moved the action up front and diced up a lot of backstory to sprinkle in between the action to create a more digestible way of giving readers information. I’m also trying to keep readers interested in the backstory by creating character sympathy earlier (evil boss) and a balance between action and background info. This is just an example (maybe not an excellent one) and I'm sure those subjects could be arranged in a variety of ways that would be better than the original. And some backstory could be revised into action. You get it. I find this ability of moving around one-liners super easy and the list of subjects becomes a reference I go back to as I make the necessary adjustments in the manuscript. You can also get an idea of which sections can be discarded—if they’re not adding anything to the story—and where you want to fill in areas with fresh writing. After the manuscript is well ordered, then we can make sure the content is broken up properly into scenes, and mold those scenes with interesting beginnings and suspenseful endings. If you like an organized way of working that won’t give you a headache, then maybe this method will help you. Are you still feeling overwhelmed and dreading your revision process? I’m here for you. Older PostStory Openings: Should We Start With Showing or Telling?